Where do we sign up for Thunder's Kids Club? How do I sign my child up for Thunder's Kids Club? A parent or legal guardian will need to fill out a waiver and decide if they would like the FREE Membership package or the MVP Membership package ($15) for the season. Do I need to renew my child's memebrship every season? That depends. If you sign up for the FREE Membership, your child's membership will continue to roll over until he/she turns 13. The MVP Membership requires annual renewal. I have multiple children who want to join Thunder's Kids Club, are there special rates for more than one (1) child? No. It is still $15/child. 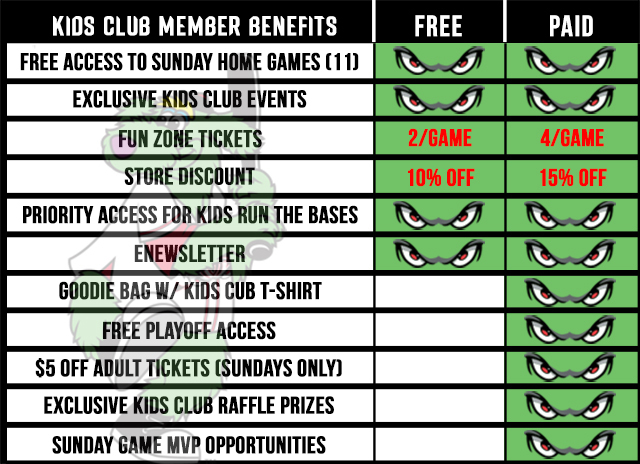 What are the perks or Thunder's Kids Club and joining the MVP Membership? What are the restrictions for Thunder's Kids Club? How will I know about outside sponsor events? You will get an email two (2) weeks in advance of the event, followed by additional emails as the event date gets closer. How do we get to the off-site sponsor appearances? You will need to provide your own transportation to Thunder's Kids Club Sponsor events. I have a question that was not answered on here. Give us a call at (951) 245-4487 and we'll be happy to help!